In 1973, Gamera sacrifices his life to rid the world of the Gyaos once and for all. Three years later, a small boy who witnessed the event named Toru finds a mysterious egg. From it, hatches a small Turtle. 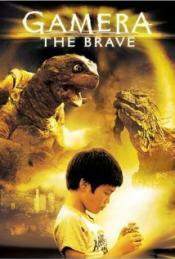 Toru and his friends raise the turtle, who turns out to be a small Gamera. After a new man eating creature named Zedus, it's up to the small Gamera to save the world as the previous Gamera had done before. This page has been seen 3435 times.